VNOG Blog: Stocks down? Go see UP! There is so much heart in the film. lol, that's alright though, I plan to see it multiple times in theaters anyways. Just confusing that some 3D showings had the short and some did not.. I have a gripe with digital projection for that particular reason... too easily for things to get left off and not shown to the audience. but AMAZING film! Loved it! My dad, sister, and I caught a midnight show on the day it came out, and the theater was almost packed to the brim with faithful supporters/fans. The audience absolutely loved it. (One lady kept taking the tissues out during the entire film.) As for myself, I can pretty much sum it up in two words: bloody brilliant. 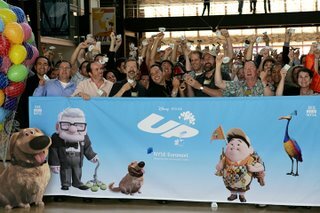 Congratulations to the entire team at Pixar for producing another heart-warming feature... and for ringing the bell! Went to see it opening day with my wife. Absolute genius storytelling. Anytime a film can make the packed-out theater so quiet you can hear a pin drop, the filmmakers have done their job. Bravo. Up was AMAZING. A. MAZ. ING. I should have heeded your warning about bringing kleenex! Brilliant art, story, vibe, dialog, everything. One of Pixar's very best. I wonder when it'll be showing here in our place... i can't wait to see Up..